I don't want to spoil the party but I probably will if you haven't seen Poldark Episode 4 and you want to. So what are you doing here? Catch up on BBC. I must have watched the entire episode with a stupid grin on my face. 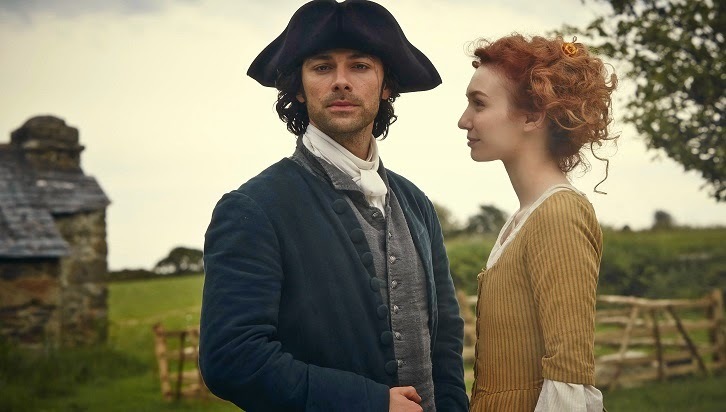 After last week's rush job of a wedding, in which Ross clearly married Demelza to—as he, himself, reiterated— a) do the right thing b) satisfy his physical needs and c) console himself for the loss of Elizabeth, Ross redeemed himself, throwing himself into the marriage with gusto. So many good things happened in last night's episode, it was like a fairy tale, frothy with happiness. Ross Poldark looked more like Ross Polbright, as he smiled and kissed and charmed his way through the episode. But you know how that goes. What goes up, must come down. Happiness this big has to be followed by a fall. Otherwise it's 'and they all lived happily ever after.' Show over. When the local society turns their backs on Ross for marrying his servant girl, he says #$%# You very much! Always dancing to the beat of his own drummer, and never one to curry favor, he told Francis it would suit him fine to live in happy and peaceful solitude with Demelza. That's my Poldark! When Demelza wails on Jud for getting into the cheese, climbing on his back and thumping away at him like a wildcat, Poldark understands for her to be the 'lady' of the house, she needs to be treated like one. He insists they hire a new kitchen serving girl for her, and that she do the actual hiring. Proving that he's not just kind and wise, he's also a feminist at heart. Welcome Jinny into the Poldark household, a nice thing to do for Jinny while her husband withers away in prison. Watching Jinny curtsy to Demelza, acknowledging her new role, while Poldark glimmers away in the background with that small smile of his, just felt good inside. Mama Mia! Verity can dance. When Demelza, awkward in her role, is fearful that she'll be judged not good enough by Ross' friends and family, Ross invites Verity to stay. 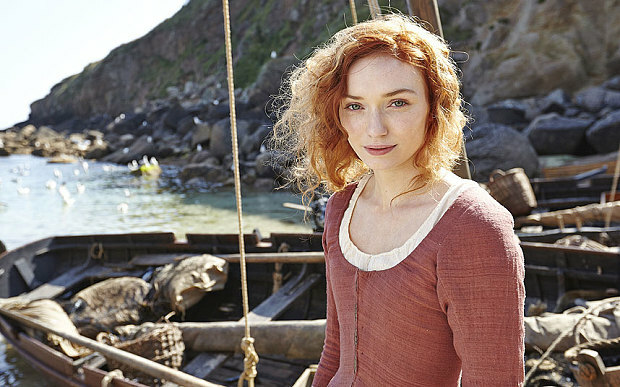 Verity, sweet Verity, finds a way to break through Demelza's shyness and soon enough they're best mates and Verity is teaching Demelza to curtsy and to dance and pick out the perfect fabrics for some new dresses. New dresses that may not fit for long because Demelza is having a baby! In the meantime they fit very well and Demelza, who heretofore has been a study in poor posture, her bodice looking like she has an almost conclave chest, suddenly has breasts! See? Not to put too fine a point on it, but no breasts. When Ross brings Demelza to his uncle's home for Christmas Eve, the snobby Warleggans drop by just in time to see Demelza make an entrance. Her hair is up, her posture is perfect, her girls on show; she looks undeniably lovely. It's plain to see she's been transformed. To the point that she can stand up for herself; when they give her barely concealed digs, she gives it right back. But like a lady, because she's learning. Suddenly... not only can Demelza sing but she has breasts too! When the guests try to make Demelza feel like she's socially inferior, inviting her to play the piano as most ladies of the time could do, Ross cuts in, says she can sing. Oh boy, can she! With just a note from the harp to get her started, Demelza hypnotizes us all with her a cappella performance. But no one more than Poldark who looks utterly bewitched. In fact, we feel slightly weird about being in the room with the couple who only have eyes for each other. Everything, just everything is going swimmingly. Even Elizabeth and Demelza seem to be bonding as we see them chatting happily away in the background while Francis and Poldark talk. But what of Poldark's failing copper mine? When even some of his financial backers have withdrawn additional funds because clearly, due to his marriage to Demelza, he's a loose cannon, leaving him on the verge of bankruptcy, wonder of wonders, miracle of miracles, they strike copper. Hurrah! "You're having my baby! What a lovely way of saying how much you love me." Of course this is the episode when Ross tells Demelza he loves her. When Poldark then learns Demelza is pregnant, there's no pregnant pause. He's overjoyed. Period. And when the women waiting day after day for their men to bring home their boats filled with fishes are finally rewarded with a bountiful catch, we're all happy for them. Even if we wonder how people in those days kept fish fresh. I couldn't help look at all those fish, silvery and shimmery, and think how they'd look in a few days time if the economic frailty of the community meant there wouldn't be enough buyers. Would joy turn to despair? Happiness to tragedy? You don't have to be a fortune teller to know there's trouble a foot in Poldark country! What goes up, must come down. Spinning wheel got to go round. There is one sad note; Poldark's Uncle Charles dies early in the episode. 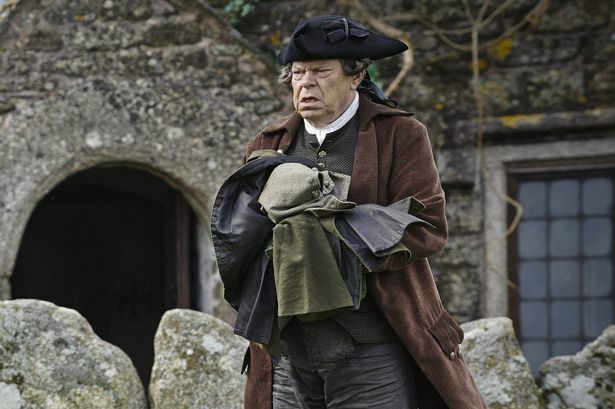 Sadly, Warren Clarke, the actor who plays Charles Poldark, died last year, November 12, 2014 before any of his Poldark episodes aired. Clarke had a long, wonderful life and career. Read the BBC announcement here.